Promotional artwork for fan Film "Godzilla:Heritage"
Godzilla: Hertage is a non-profit labor of love. From what we have seen so far it will be a masterpiece. You can see production videos below from their Facebook page facebook.com/GodzillaHeritage. The making of the costume alone is inspiring, but the few teaser audio clips and the description of the movie really alone would send cills up the dorsal spine of any G-fan. 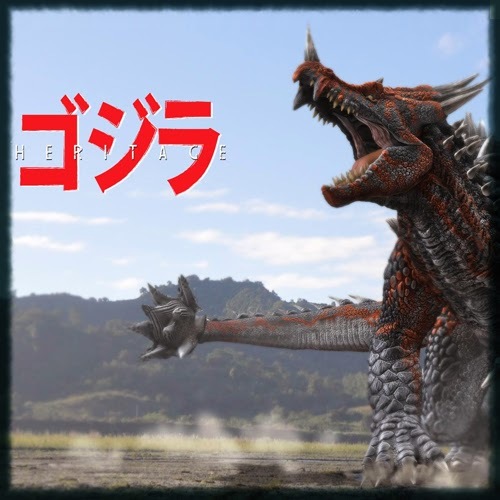 The film is described as, "The film seeks to return the Godzilla mythology to its darker roots and ground the character and some of its memorable kaiju in an altered continuity that explores a world where they have been a staple of everyday life for almost 60 years. The project will utilize traditional suitmation and miniatures as well as more contemporary effects. The film is a non-profit project . "Godzilla" and all related character designs are copyright Toho Company, Limited." Since Godzilla's first attack in 1954, mankind has been under constant threat from gigantic creatures known as "Superfauna" - animals mutated by the coming of the nuclear age and man's abuse of the atom's destructive power. Humanity was united against a common foe and for almost 60 years, worked collectively to study and combat the creatures as millions died, cities crumbled and the world's economy continued to collapse. Now in 2012, the world seems to finally be bringing the threat under control. Jack Martin is a correspondent for United World News and the grandson of Pulitzer Prize winning journalist Steve Martin, who's riveting coverage of the 1954 raid on Tokyo made him a legend. With his grandfather's shadow always overhead, Jack has spent his career attempting forge his own legacy and in the process, has severally damaged both his reputation and his marriage to family friend, Amaya Ogata. Before leaving the agency, Jack decides to travel to a small pacific island with his life-long friend Mitch Lawrence, who now owns United World News. While the two wait to attend a ground-breaking ceremony for a new UWN building, Godzilla suddenly reappears after nearly 30 years of absence...and he hasn't returned alone. With the King of the Monsters' threat looming, Jack must decide whether to flee or finally embrace his heritage and report the attack as it happens - risking not only his life, but the lives of his best friend and his wife. Perfect. Huh? It has great continuity with the original while breathing some interesting new elements for a modern age. Check out the production videos below as well as the audio teasers. These audio teasers below really give a sense of authenticity to this film. Super cool! Still looks promising. I hope it lives up to the hype.